From long-term housing to in-home supports, Step By Step’s Residential services span a wide variety of scenarios and with one shared goal: Increased independence, improved quality of life and ongoing safety for everyone we serve. 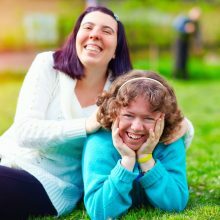 Community Homes Between one and four adults live in each of Step By Step’s Community Homes, which provide individualized support and supervision up to 24 hours a day. Intermediate Care Facilities/ID These specialized residences house between one and eight adults each. Independence is developed and encouraged and medical support is available. Respite When unexpected circumstances arise, Respite steps in. Our temporary housing offers relief to caregivers, family members and individuals as needed, aiming for as little interruption to daily routines and care as possible. Lifesharing Households across Pennsylvania open their hearts and homes to eligible adults via Lifesharing, the program that gives individuals and their sponsor families the benefits of shared living and experiences. In-Home and Community Support Individuals living independently or with family or friends sometimes need the added assistance offered by Step By Step’s mobile resources. Services include functional assessment, development of strategies to support the individual based upon assessment, and the provision of training individuals, staff, relatives and caregivers. Completed on 1:1 basis between individual and behavior support professional with a Master's Degree or under the direction of someone with a Master's Degree. Community Residential Rehabilitation Residential Rehabilitation assists individuals in acquiring, retaining and improving the communication, socialization, self-direction, self-help and adaptive skills necessary to reside in the community. Fairweather Lodge The Fairweather Lodge program, located in Allentown, is a research driven, recovery oriented housing model for adults with mental health disorders.